windowsills, ceilings, ceiling fans and picture frames. 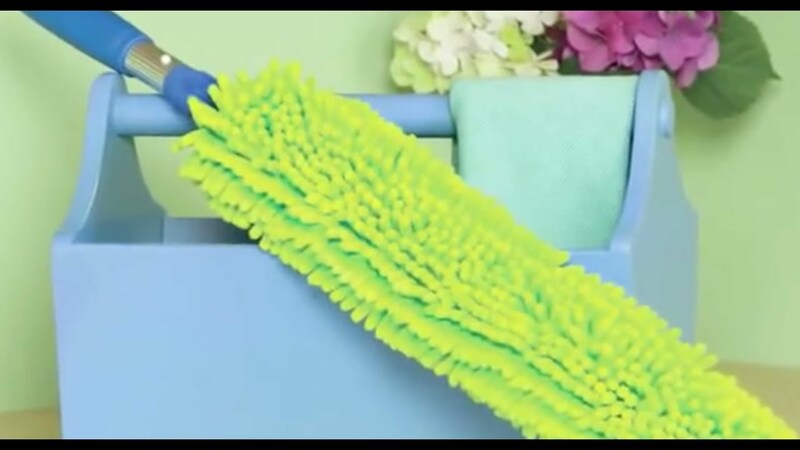 The removable sleeve has nubby chenille on one side and microfiber on the other and works like magic to gather dust and dirt from even the most difficult-to-reach places! 45 cm x 7.5 cm / 17.72" x 3"
Problem: We all have those hard-to-reach nooks and crannies in our homes that seldom, if ever, get cleaned properly. Reaching high, out-of-the-way surfaces and angles can be difficult, so hard-to-clean areas often go ignored. Solution: The flexible, bendable EnviroWand adapts to solve a wide variety of cleaning challenges. It attaches easily to the Telescopic Mop Handle to reach high surfaces and those awkward, out-of-the-way areas. Now you can clean even the most hard-to-reach surfaces, tight spots and angles, leaving them dust-free and shiny! • Slip sleeve on and then bend EnviroWand to adapt to your needs. • The EnviroWand easily attaches to the Telescopic Mop Handle. Just squeeze the two buttons on the base and pull to remove it from the handle. Then slip the wand into the mop handle, squeeze the buttons and slide into place. • To remove the sleeve for washing, straighten the EnviroWand and then slip the sleeve off wand. • To use wet, remove sleeve. Dip sleeve in water, wring out excess and replace sleeve on EnviroWand. • Sleeves that have been used heavily should be laundered using a Norwex laundry detergent, which contains no fillers, after each use. • Flexible design makes cleaning quicker and easier. • Interchangeable handle works with the Telescopic Mop Handle to comfortably clean hard-to-reach areas. • Sleeve is made of 80/20 polyester/polyamide Norwex Microfiber, offering the same cleaning benefits, cost benefits and environmental benefits as other Norwex Microfiber products. our homes wind up in dust as they migrate from home products like furniture, electronics, plastics and fabric. They also come in through open doors and windows and on our shoes.